Hello and welcome back to our 7-day itinerary exploring South Iceland. We started off the first leg of our journey with visits to Seljalandsfoss waterfall, Skógafoss waterfall, and the DC-3 plane crash site at Sólheimasandur beach. 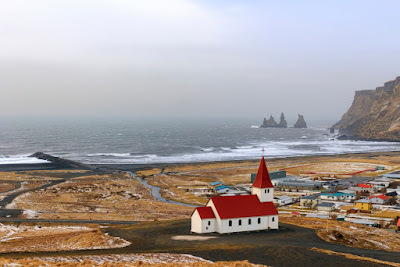 Let's continue by exploring the quaint coastal village of Vík í Mýrdal (Vík), the black sand beaches and hexagonal basalt columns of Reynisfjara, and the lighthouse and rock arches of Dyrhólaey peninsula. South Iceland has a lot to offer, so let's visit one of the most popular areas of the Ring Road. This is a more relaxed stop than yesterday, which was jam-packed with sightseeing activities. Iceland’s southernmost village is the perfect place to stop either on your way to or from Vatnajökull National Park. You'll find lots of restaurant and accommodation options in this area. 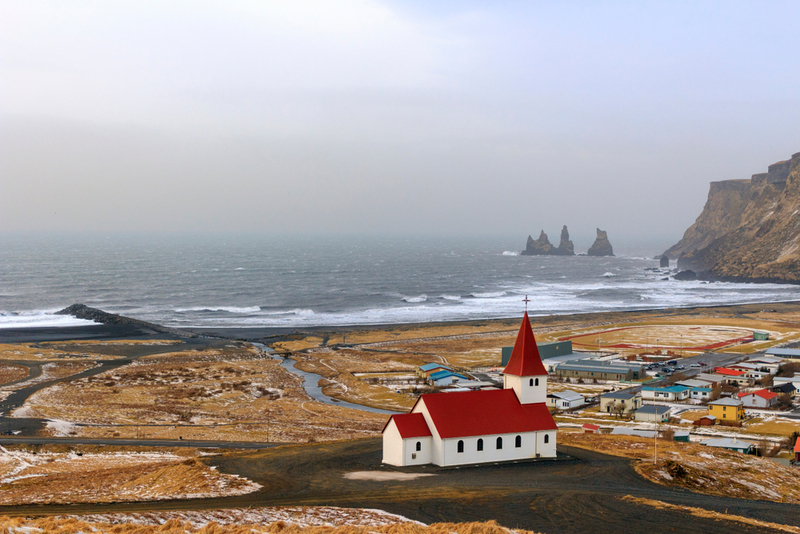 People come for the black sand beaches and many times will use Vík as their overnight base to explore other nearby attractions. Located around 110 miles (186 kilometers) from Reykjavik, it’s the ideal setting to rest, recharge and get to know small-town Iceland. It will take you about two and a half hours to reach here from the country's capital. The town itself is small, with only about 300 residents or so. Resting at the foot the massive Mýrdalsjökull glacier and nearby by Eyjafjallajökull, the town's geology and history have been shaped by Katla volcano, the fiery giant laying just beneath Mýrdalsjökull ice cap. One of the town’s most recognizable landmarks is the Reyniskirkja church. The typically Icelandic building features signature white walls and a colorful, pointy red roof. This wooden church dates back to 1929 and is a beloved part of the community. 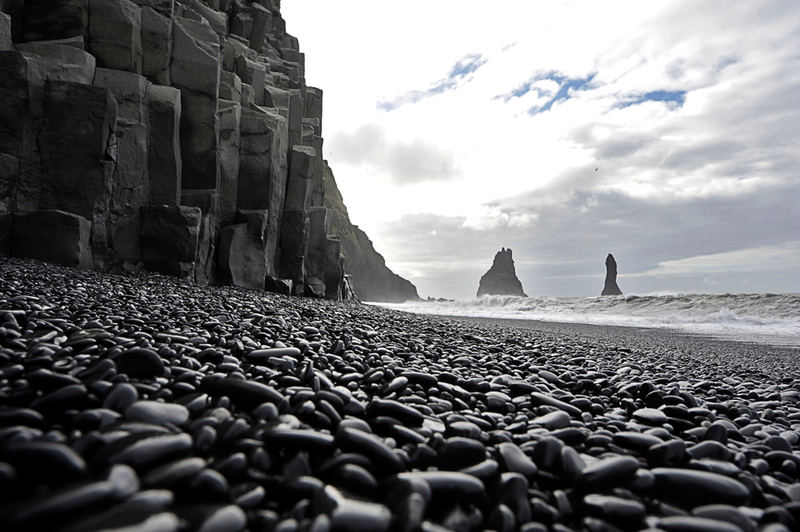 As you head from Vík towards the shoreline, you'll find yourself at Reynisfjara black sand beach. 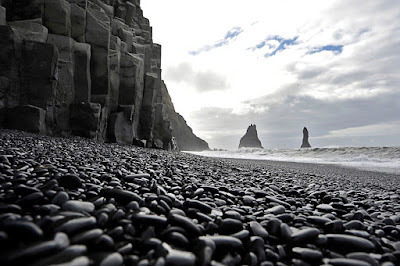 Not only will you be mesmerized by the black sand, but the beach also features mysterious hexagonal columns of volcanic basalt rock. The long structures create a dramatic backdrop to an already otherworldly setting. This breathtaking zone Is especially lovely at night during the Northern Lights period in Iceland and during the Midnight Sun. Something to be aware of here are the waves. They have a strong pull and can sneak up on you very quickly. Please be careful! Whatever you do, don't go swimming here and stay relatively far away from the water's edge. Once voted as one of the Top 10 non-tropical beaches in the world to visit, Reynisfjara is a must to do. Just west of Vik you'll find Dyrhólaey, the nearly 400 foot (120-meter) promontory and rock arch that form part of the cliff. Its name actually means “door hole” in Icelandic. When there are no large waves, some boats can sail right through it. Keep an eye out for the Reynisdrangar rock formations. According to legend, they were two trolls trying to drag a ship onto land. When the sun rose in the middle of their exploits, they turned to stone and have remained that way ever since. 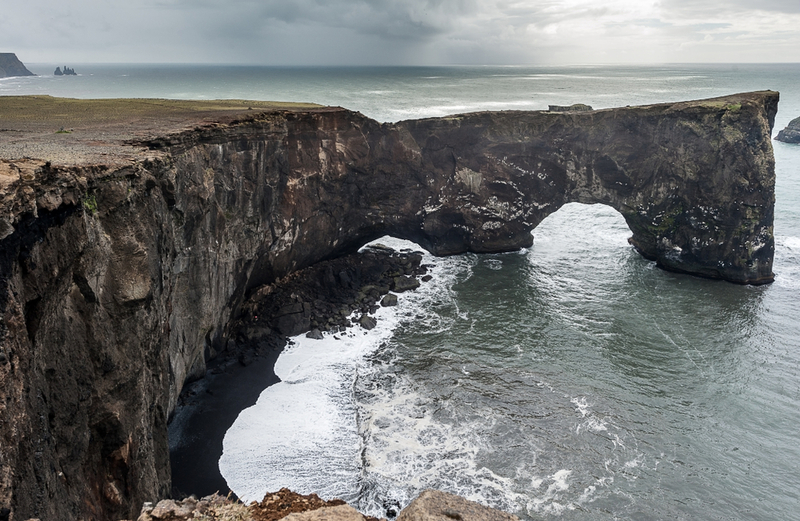 Bird life is abundant in this area, and Dyrhólaey’s cliffs are a prime spot for bird watching. Icelandic puffins and Eider ducks what are the dominant species in the area. Come between the months of May and August to see huge populations of puffins during their mating season. Atop the cliff rests the Dyrhólaey Lighthouse. It gets quite windy here, so be careful not to approach the cliff ledge. After you've spent the morning or the afternoon exploring Vik and environs, it's time to head inside for a warming bowl of something hot and tasty. Stop in at one of Vík’s best restaurants and prepare for tomorrow's adventure. It's a big day as we will be exploring Europe's largest national park, Vatnajökull, and its famous glaciers and glacier lagoon.